Yahya Abu Hammam, born Djamel Okacha, is a U.S.- and U.N.-designated terrorist and al-Qaeda in the Islamic Maghreb (AQIM)’s emir (leader) in West Africa and the Sahel.“Treasury Designates an Additional Senior Leader of Al-Qa’ida in the Lands of the Islamic Maghreb,” U.S. Department of the Treasury, February 14, 2013, http://www.treasury.gov/press-center/press-releases/Pages/tg1855.aspx; Bill Roggio, “US adds senior AQIM commander to terrorist list,” Long War Journal, February 16, 2013, http://www.longwarjournal.org/archives/2013/02/us_adds_aqim_command.php; Security Council Al-Qaida Sanctions Committee Adds Djamel Akkacha to Its Sanctions List,” United Nations, February 5, 2013, http://www.un.org/press/en/2013/sc10908.doc.htm. He has reportedly waged jihad since joining an AQIM predecessor group in the early 2000s.Tim Lister and Paul Cruickshank, “Al Qaeda reported to suffer double blow in Sahara,” CNN, March 3, 2013, http://www.cnn.com/2013/03/03/world/aqim-double-blow; Lamine Chikhi, “New leader named for Al Qaeda in the Islamic Maghreb: TV,” Reuters, March 24, 2013, http://www.reuters.com/article/us-algeria-qaeda-okacha-idUSBRE92N0C020130324. Hammam is believed to continue to operate out of Mali.Bara de Dara, “Regain de tensions à Kidal : L’explosion d’une mine fait 7 casques bleus sénégalais blesses,” maliweb.net, January 13, 2015, https://www.maliweb.net/non-classe/regain-de-tensions-kidal-lexplosion-dune-mine-fait-7-casques-bleus-senegalais-blesses-741632.html; Ibrahim Yattara, “IBK mise sur Modibo Keïta pour sortir le Mali de la crise,” maliweb.net, January 15, 2015, http://www.maliweb.net/non-classe/ibk-mise-sur-modibo-keita-pour-sortir-le-mali-de-la-crise-744302.html. U.S. officials reportedly consider Hammam to be a senior aide to al-Qaeda leader Ayman al-Zawahiri.“Tunisia: Drone Strike ‘Targeted Al-Qaeda Leader’,” AllAfrica, June 5, 2012, http://allafrica.com/stories/201206070378.html. He is also considered the second-in-command and “right-hand man” of AQIM emir Abdelmalek Droukdel, who reportedly appointed Hammam to his current position in 2012.Lamine Chikhi, “New leader named for Al Qaeda in the Islamic Maghreb: TV,” Reuters, March 24, 2013, http://www.reuters.com/article/us-algeria-qaeda-okacha-idUSBRE92N0C020130324; Tim Lister and Paul Cruickshank, “Al Qaeda reported to suffer double blow in Sahara,” CNN, March 3, 2013, http://www.cnn.com/2013/03/03/world/aqim-double-blow; Malek Bachir and Nefis Khider, “Armed Islamist leaders in Libya claim al-Qaeda's Belmokhtar is still alive,” Middle East Eye, June 13, 2018, https://www.middleeasteye.net/news/algeria-libya-mokhtar-belmokhtar-alive-qaeda-aqim-islamic-state-1799384986; “QDi 313. DJAMEL AKKACHA,” United Nations Security Council, accessed October 9, 2018, https://www.un.org/sc/suborg/en/sanctions/1267/aq_sanctions_list/summaries/individual/djamel-akkacha. Since AQIM merged with local Salafist groups Ansar Dine and al-Murabitoun to form Jamaat Nusrat al-Islam wal Muslimeen (JNIM) in 2017, Hammam also functions as the deputy of Ansar Dine leader Iyad Ag Ghaly.Nefis Khider, “EXCLUSIVE: Sahel al-Qaeda offered immunity in 'secret French-backed deal',” Middle East Eye, April 23, 2018, https://www.middleeasteye.net/algeria-france-mali-secret-agreement-militant-surrender; Thomas Joscelyn, “Analysis: Al Qaeda groups reorganize in West Africa,” Long War Journal, March 13, 2017, https://www.longwarjournal.org/archives/2017/03/analysis-al-qaeda-groups-reorganize-in-west-africa.php. Hammam previously led AQIM’s al-Fourqan Brigade.Bill Roggio, “US adds senior AQIM commander to terrorist list,” Long War Journal, February 16, 2013, http://www.longwarjournal.org/archives/2013/02/us_adds_aqim_command.php. He also served as AQIM’s “governor” in Timbuktu, Mali, when the city was held by Islamist rebels between April 2012 and January 2013.Adam Nossiter, “In Timbuktu, Harsh Change Under Islamists,” New York Times, June 2, 2012, http://www.nytimes.com/2012/06/03/world/africa/in-timbuktu-mali-rebels-and-islamists-impose-harsh-rule.html; Adama Diarra, “French, Malians retake Timbuktu, rebels torch library,” Reuters, January 29, 2013, http://www.reuters.com/article/us-mali-rebels-idUSBRE90O0C720130129. In 2013, Hammam has been designated as a terrorist by the United States, the United Nations, the European Union, and France.“Yahya Abu el Hammam,” U.S. Department of State Rewards for Justice, accessed October 9, 2018, https://www.rewardsforjustice.net/english/yahya_hammam.html; “Liste Unique de Gels,” La direction générale du Trésor, accessed October 9, 2018, https://www.tresor.economie.gouv.fr/Ressources/11448_liste-unique-de-gels. The United Nations referred to Hammam as a “coordinator” of groups associated with AQIM in northern Mali, and noted that he was responsible for several attacks in the region.“Security Council Al-Qaida Sanctions Committee Adds Djamel Akkacha to Its Sanctions List,” United Nations, February 5, 2013, http://www.un.org/press/en/2013/sc10908.doc.htm. Hammam has reportedly kidnapped several European hostages, some of whom have been released in exchange for ransom payments that help to finance AQIM’s activities.“Treasury Designates an Additional Senior Leader of Al-Qa’ida in the Lands of the Islamic Maghreb,” U.S. Department of the Treasury, February 14, 2013, http://www.treasury.gov/press-center/press-releases/Pages/tg1855.aspx. Hammam has allegedly met with several AQIM and ISIS leaders in Libya in spring 2018. Rumors about close cooperation between the terrorist groups have subsequently circulated, but are later assessed as unlikely by Algerian security experts.Malek Bachir and Nefis Khider, “Armed Islamist leaders in Libya claim al-Qaeda's Belmokhtar is still alive,” Middle East Eye, June 13, 2018, https://www.middleeasteye.net/news/algeria-libya-mokhtar-belmokhtar-alive-qaeda-aqim-islamic-state-1799384986. Abu Yahia“Yahya Abu el Hammam,” U.S. Department of State Rewards for Justice, accessed November 14, 2016, https://www.rewardsforjustice.net/english/yahya_hammam.html. Akkacha Djamel“Treasury Designates an Additional Senior Leader of Al-Qa’ida in the Lands of the Islamic Maghreb,” U.S. Department of the Treasury, February 14, 2013, http://www.treasury.gov/press-center/press-releases/Pages/tg1855.aspx. Djamel OkachaLamine Chikhi, “New leader named for Al Qaeda in the Islamic Maghreb: TV,” Reuters, March 24, 2013, http://www.reuters.com/article/us-algeria-qaeda-okacha-idUSBRE92N0C020130324. Jamel Akacha“Treasury Designates an Additional Senior Leader of Al-Qa’ida in the Lands of the Islamic Maghreb,” U.S. Department of the Treasury, February 14, 2013, http://www.treasury.gov/press-center/press-releases/Pages/tg1855.aspx. 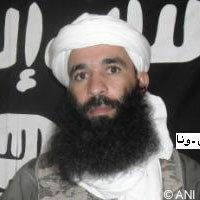 Jemal OukachaBill Roggio, “US adds senior AQIM commander to terrorist list,” Long War Journal, February 16, 2013, http://www.longwarjournal.org/archives/2013/02/us_adds_aqim_command.php. Yahia Abou el Hammam“Treasury Designates an Additional Senior Leader of Al-Qa’ida in the Lands of the Islamic Maghreb,” U.S. Department of the Treasury, February 14, 2013, http://www.treasury.gov/press-center/press-releases/Pages/tg1855.aspx. Yahia Abou el Hoummam““COMMISSION IMPLEMENTING REGULATION (EU) No 123/2013 of 12 February 2013 amending for the 186th time Council Regulation (EC) No 881/2002 imposing certain specific restrictive measures directed against certain persons and entities associated with the Al Qaida network,” EUR-Lex, February 12, 2013, http://eur-lex.europa.eu/legal-content/EN/TXT/?uri=CELEX:32013R0123. Yahia Abu El HamamLamine Chikhi, “New leader named for Al Qaeda in the Islamic Maghreb: TV,” Reuters, March 24, 2013, http://www.reuters.com/article/us-algeria-qaeda-okacha-idUSBRE92N0C020130324. Yahya Abou El HamameAgence France Presse, “New AQIM chief warns on French hostages,” Modern Ghana (Accra), October 20, 2012, http://www.modernghana.com/news/425209/1/new-aqim-chief-warns-on-french-hostages.html. Yahya Abu el Hammam“Yahya Abu el Hammam,” U.S. Department of State Rewards for Justice, accessed November 14, 2016, https://www.rewardsforjustice.net/english/yahya_hammam.html. The U.S. Department of the Treasury designated Hammam as a Specially Designated Global Terrorist under Executive Order 13224 on February 14, 2013. “Treasury Designates an Additional Senior Leader of Al-Qa’ida in the Lands of the Islamic Maghreb,” U.S. Department of the Treasury, February 14, 2013, http://www.treasury.gov/press-center/press-releases/Pages/tg1855.aspx. The EU listed Hammam as a ‘Natural person’ following the U.N. designation on February 5, 2013.“COMMISSION IMPLEMENTING REGULATION (EU) No 123/2013 of 12 February 2013 amending for the 186th time Council Regulation (EC) No 881/2002 imposing certain specific restrictive measures directed against certain persons and entities associated with the Al Qaida network,” EUR-Lex, February 12, 2013, http://eur-lex.europa.eu/legal-content/EN/TXT/?uri=CELEX:32013R0123. France designated Hammam as a terrorist according to EU regulations on February 12, 2013.“Liste terroriste unique,” La direction générale du Trésor, accessed May 5, 2015, http://www.tresor.economie.gouv.fr/5563_liste-terroriste-unique. The U.N. designated Hammam as an al-Qaeda affiliate on February 5, 2013.“Security Council Al-Qaida Sanctions Committee Adds Djamel Akkacha to Its Sanctions List,” United Nations, February 5, 2013, http://www.un.org/press/en/2013/sc10908.doc.htm. Yahya Abu Hammam, born Djamel Okacha, is a U.S.- and U.N.-designated terrorist and al-Qaeda in the Islamic Maghreb (AQIM)’s emir (leader) in West Africa and the Sahel. Caleb Weiss, “AQIM commander threatens France in audio statement,” Long War Journal, December 24, 2015, http://www.longwarjournal.org/archives/2015/12/aqim-commander-threatens-france-in-audio-statement.php.